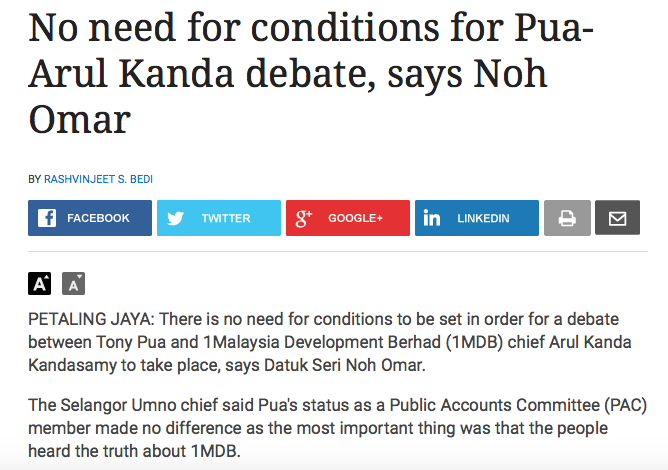 Updated: Just as Noh Omar may have feared, Pua is trying to wriggle out of the live debate that he had asked for in the first place [see article below, h e r e]. I hope Arul will be kind enough to let him keep his PAC post so that Pua will have no more excuses but to let the debate happen. At first I felt like thumping Noh Omar for speaking "for" YB Tony Pua h e r e. Because I happen to agree with the majority view that if Pua wanted a debate with Arul Kanda, he should stop wearing the PAC hat and take on the 1MDB man on a level playing field. Otherwise, Pua should wait for the PAC to formally interrogate Arul. He can't have his cake and eat it too. 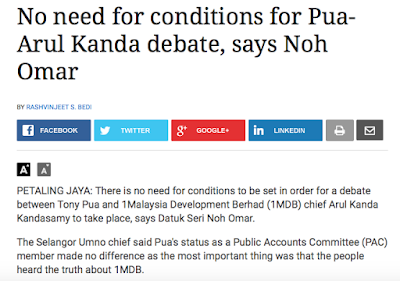 But then a pal pointed out to me that Noh had made that "no conditions" statement because the UMNO man feared that Pua would just use that as an excuse to get out of the debate. "Noh Omar tak mahu Tony cabut lari, bro," he said. The debate has turned out to be a trap Pua had laid for himself, so it seems. The DAP man had challenged Arul to the debate thinking that the 1MDB chief would cower in fear. But Arul, who had said he'd face anyone on 1MDB, didn't even blink an eyelid (Arul to Pua: Challenge accepted). Arul only asked that Pua quits his PAC post (by virtue that PAC is investigating 1MDB) so that Malaysians get a good, clean fight. RTM has said it will broadcast debate live. Even the staunchest 1MDB-Arul critics are looking at Arul in a slightly different light after he'd accepted Pua's duel wihout flinching: I sense a bit more regards for the underdog here. Those who know Arul know that the man is no chicken. He's not just bald, he's bold and brave. And he's got the credentials. The RMC boy has dealt with the most powerful men in the world, men whose wealth will make Ananda Krishnan look like a crony. Pua is 1MDB's longest critic (since 2011, at least) but not the most effective. The 1MDB issue only gained traction after Tun Dr Mahathir Mohamad picked it up early this year to lead his campaign to oust Prime Minister Najib Razak. In other words, I think Pua had made a mistake in challenging Arul to the debate. But since the challenge has been accepted, Pua would be forever seen as a coward if he backs out now. For party and comrades, Pua has to get into the ring. Only this time, and for once, he doesn't get to play judge, jury and executioner. I think Noh Omar should think before he speaks. We should not allow Tony Pua to remain as a PAC member if he wants to challenge Arul to a public debate on 1MDB. If he remains in PAC, whatever he says about 1MDB either positive or negative will impact his position in PAC. Thus Tony Pua should resign from PAC although he may be in a fix or embarrass himself. By the same token it is more important that the PAC Chief from Pekan should resign because he cannot, will not carry out a open investigation as he is beholden to his Master....but of course you will never agree. Barrack Obama is also a great debater and does not meant he is brilliant ! All Malaysian are very happy that we have Arul Kanda, Najib and Kak Mah. Not necessary in that order. "Those who know Arul know that the man is no chicken. He's not just bald, he's bold and brave. And he's got the credentials. The RMC boy has dealt with the most powerful men in the world, men whose wealth will make Ananda Krishnan look like a crony. Pua is 1MDB's longest critic (since 2011, at least) but not the most effective. The 1MDB issue only gained traction after Tun Dr Mahathir Mohamad picked it up early this year to lead his campaign to oust Prime Minister Najib Razak." What sad little man you are. The 1MDB issue gained traction from about 2011, when regional investment managers were already questioning why an obscure company from Malaysia with RM1 million in seed capital had racked up almost RM13 billion in debt for no obvious reason. PS: ".....men whose wealth will make Ananda Krishnan look like a crony"? AK not a good example bro, as your bald heroine told quite a few lies about the AK bailout of 2 billion. You seem to have forgotten that. Millions are scratching their head. How is Tony trying to "wriggle" his way out. By not resigning? I really dont understand this. He wants a debate, arul says quit your post in pac then we go for it. Who is setting terms and trying to wriggle out bro? I mean what is this? This is funny but at the same time stupid. Good luck trying to hoodwink people bro. Semalam, tanpa diwar-warkan terlebih dahulu, TV1 telah menyiarkan 'soal-tak-jawab' versi omputih oleh Arul Kanda, rakaman Hello Malaysia, 'Facts and Myths' atas ihsan BERNAMA. Yang pelik, TV1 tidak menyediakan sarikata dalam bahasa Kebangsaan. Mengapa? Kerana Arul tidak menjawab soalan yang ditanya, terutamanya oleh Mikail? Mungkin TV1 mahu menunjukkan kepada 'orang-kampung' bahawa 1MDB tiada apa yang mahu disorok bila mereka hanya dapat melihat bahawa Arul berani menjawab soalan. Tetapi kepada penonton TV1 yang paham omputih dan mengikuti siaran 'Facts and Myths' itu, sudah tentu beranggapan bahawa 1MDB ada 'something to hide'. It's not about who can speak better. It's about honest answers to honest questions. pandai tuduh , kutuk ...but when the truth is to reveal they gave all kinds of excuse. if u a pac man then please resign lah if u want to debate or else just wait for the pac committee meetings. if arul is required to answer questions then pua ka should be answering questions too..fair is fair .. The debate or talk show or whatever they call it may took place, why not extend the invitation to Tun, since he is one of the biggest critic of 1MDB. "It's not about who can speak better. It's about honest answers to honest questions"